These bathroom tile ideas will define the overall look of your bathroom. So to help you make this major design decision, we’ve got a list of budget-friendly bathroom tiles that won't sacrifice either functionality or aesthetics. Imagine how many tiles you will need should you decide to tile your bathroom floor and walls. The expense alone is crazy! That is why it is important to save in whatever way you can. You can save time and money by using the same tiles and just playing with patterns and colors, or you can go for less by maximizing the tiles of your choice. 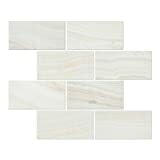 We are here to give you bathroom tile ideas you can consider for building your dream bathroom. Subway tiles are transformed into something interesting in this bathroom wall. Instead of straight lines, angles are used to give off a unique impressive design. This patterned floor out of linoleum tiles is definitely making a bold statement. This awesome project may look like a ton of work, but the result is pretty amazing! Making it all worth it! You can always upgrade while playing just within the limits of your budget, just like this upgrade involving bathroom wall tiles. It transforms a bathroom wall from ordinary to fabulous! 42" long shaft with extra wide 4" blade makes short work of tiles and linoleum covered floors. Play with the arrangement of your tiles to create impact. Check out how you can have your very own herringbone floor. I guarantee you it's very much doable with an exceptional result. You will not look at hex tiles the same way again now that you know how to play with patterns and designs. 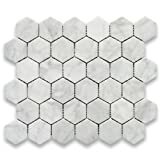 Get inspired with these wonderful hex tiles floor details and create your own design in your bathroom. Subway tiles may be simple, but they exude a tranquil vibe for your bathroom. There’s a reason why it’s said that there’s beauty in simplicity. 2-in Wide Machine Sharpened Thinset Removal Bit, 0.401 in shank- MONEY BACK GUARANTEE!!! 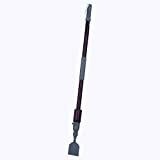 This chisel is designed to remove Thinset (the mortar that holds tile to the floor) and is useful for small areas (100-200 sqft) . Please note this product is not to be used to remove the tile. A stylish bathroom statement means going for either a dark or light shade. In this case, they've used dark tiles – looks way more stunning than light ones. This bathroom gives off a classic vibe with just the choice of bathroom tiles. Use this classic pattern tiles to display the calming beauty of vintage elegance. Here is an impressive infographic to guide you before shopping for those tiles. Check your options with tiles that are budget-friendly, yet provide exceptional style and functionality. There are so many bathroom tiles you can choose from, but it’s important that you do not go overboard on something with budget–friendly options also present. Take your finances, theme, availability, and plans into consideration. Which bathroom tile ideas are you keen on doing? Let us know in the comments section below!